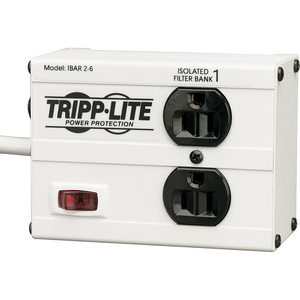 Tripp Lite's Isobar 2-6 Surge Suppressor has 2 outlets, a 6-ft. cord with a space-saving right-angle plug, and 1410 joules of energy absorption. Isobars are virtually indestructible with their heavy-duty, all-metal housing which won't burn, crack, or melt. $50,000 Ultimate Lifetime Insurance. No warranty cards required for coverage!